One thing I noticed when I moved here, is just what a magical place Aberdeenshire is. Everybody has heard of Stone Henge in Salsibury, but not many know there are many many more stone circles still standing in Aberdeenshire in particular; so many that some are not even recorded or on a map! The largest and most impressive are preserved heritage sites, but the smaller ones are just in corners of fields, overgrown, and only visible in early spring when the snow has flattened the tall grass and the new grass has not grown over them again. They are all unique; Some have guardian spirits - some have a lot of spirits, and some are just sleeping through the eons. I'ts called Easter Aquhorthies, and is accessible by car to a small car park about 100 yards away - then by foot along the bridal path in the photo. The views are spectacular and far enough away from traffic to appreciate the calm. It is often deserted so you can have time to meditate without being disturbed. I have visited here at night without problems. It is still used to celebrate equinoxes by locals, and has at least one guardian spirit who is good - provided you are respectful. I get very good feelings every time I come here, and hear music often. Historians and archaeologists are puzzled by cup and ring marks on the stones, but I have seen how they were made. What I saw was a leader of Druid type dress with a heavy staff - that had an iron ring fitted at it's base. In a ritual he would walk around the stones and strike each of them with his staff, saying words as he did - blessing each group of people who were represented by a stone. As he did so - often sparks were seen as the staff struck the stones. This must have been a magical sight! This I think explains the cup marks left behind. Another circle quite near is at Daviot. This has a small car park also about 50 yards to the right of the photo, and a view out to the left over the fields. The woods, in the direction downwards from the photo is home to red deer, and I have seen one recently who just watched me cautiously. This one is also used by locals at solstices, and last Yule I visited to find one snowball on each and every stone. This place has been disturbed by archaeologists, and has a very different feeling to the first one mentioned. There are over 50 active spirits here. When I visit they are all standing around the outside of the main circle and are mostly older people in their 50's. On my first visit I made the mistake of sitting inside the circle - and they all showed up expressing their disapproval ! Since then I have not entered the circle and they have mellowed - some of the women waving at me, but they are always there. They wear simple long dressing gown style clothes, tied at the waist. After several visits I read the history and found that to the side - the other flat ring the archaeologists found many burned skeletons, and pronounced it a crematorium site. From my experience and my partners - this was where they died, but they were attacked - several times and their dwellings burned down. - Not exactly what was written by the archaeologists ! 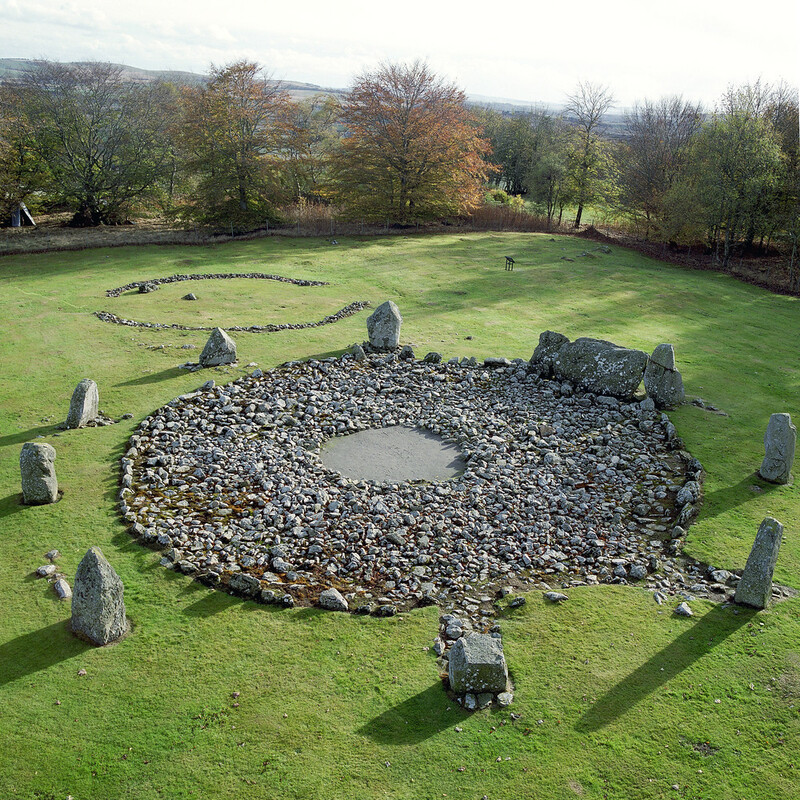 They also left the stones in the centre rough. This is not as I saw it, as when I saw it they were all laid in the earth with a flat surface so it could be walked on. Not this pile of rubbish! To illustrate how many circles there are I have included a link to a map. Last edited by Rowan222 on Sat Dec 16, 2017 11:30 pm, edited 2 times in total. Easter Aquhorthies is one of the few that still have their full complement of stones. Very intriguing, especially at being able to go there for Meditation. Great pics, Thank-you, such a deep history there. Free Hosting and Sharing, very secure, remember to go to your account settings to set to private or public. Must be great to go meditate there alone, especially as a sensitive to pick up on this history / vibes of the place.